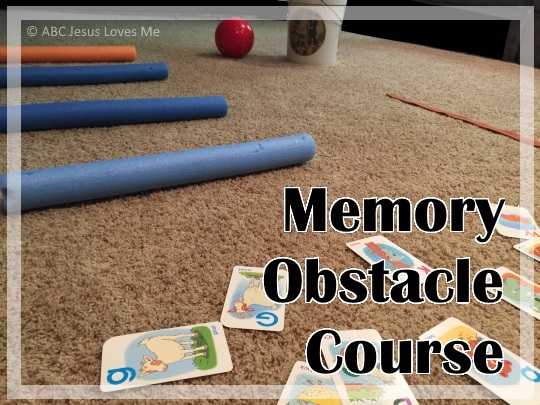 One of the gross motor activities included in the ABCJLM curricula is the "Memory Obstacle Course." This obstacle-course-with-a-twist that we learned in Occupational Therapy was frequently requested by our children when they were young. They had so much fun doing it that they didn't realize they were getting exercise and learning. An added plus is that this activity can be done with more than one children at a time. 1. Set up an obstacle course. Make sure that the course begins and ends at the same spot. Examples are listed below of what to include in the course, but the sky is the limit. 3. Explain the course to the child and be very specific. Boundaries will be tested during this activity so be prepared to set firm limits. If you want the child to jump a bunny hop, make sure they understand this and that a gallop is not correct. Have the child start over when activities are not done correctly. 4. Explain to the child that you are going to tell them a memory object to get in the middle or at the end of the course. Tell them that you will not remind them of the object, so they need to remember it all on their own. Have the child repeat the memory object before beginning the course. 5. As the child's memory improves, have the child remember more items (two puzzle pieces or a color and shape), and add music in the background. For fun, add a timer to see how fast the child can go through the course. Adult: For this obstacle course, you are going to hop over the pool noodles keeping both feet together. Then carefully dribble the soccer ball around the bucket. The tightrope on the orange line placing your feet together. You will step four times. How many times? (Four) Here are the flashcards that you will need to bring back to the start. You will need to remember which one to bring back. I will not help you, so really pay attention! Then you can place the flashcards in the bucket and sit criss-cross applesauce until I give you the next item. Do you have any questions? Adult: I want you to bring back a letter that says /s?. What are you going to bring back? Child: A letter that says /s/. Adult: (After the child performs the course correctly and picks up an object) What letter did you pick up? Adult: Great memory. Good job. Adult: For this obstacle course, you are going to crawl on your belly under the "Trick-a-ma-stick." Be very careful that you don't hit the top or sides. Then you will crawl over the beanbags. Work hard not to fall down and do not dive into them. Then jump on the mini trampoline five times. How many times? (Five) Here are the puzzle pieces that you will need to bring back to the start. You will need to remember which one to bring back. I will not help you, so really pay attention! Then you can place the puzzle piece in the puzzle and sit criss-cross applesauce until I give you the next item. Do you have any questions? Adult: I want you to bring back a circle puzzle piece. What are you going to bring back? Adult: (After the child performs the course correctly and picks up an object) What shape did you pick up? 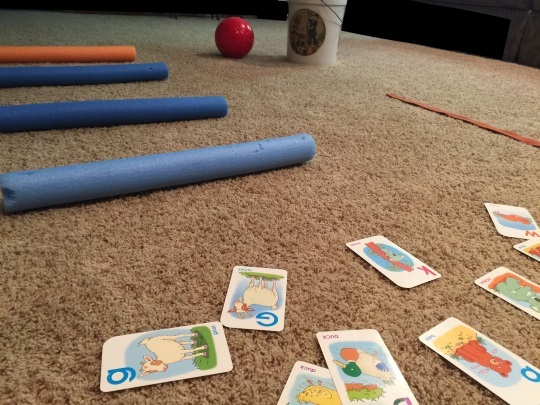 Bunny hop (hop forward with feet together) five times or over pool noodles. Crawl through a tunnel. You can also create a tunnel by placing a sheet over some chairs placed across from each other. Jump on large bubblewrap that is taped down. 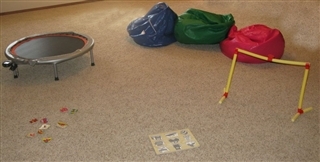 This is a wonderful sensory activity but can be very difficult for children with SPD. Jump or hop between point A and B on a jumping ball. Climb over an ottoman or footrest. Do five jumping jacks, sit-ups, pushups, etc.. Walk on objects such as river stones or sensory balance pods for balance. Have your child zigzap through cones. Toss 3-5 soft balls or stuffed animals into a laundry basket several feet away. Go up the ladder and down the slide. Swing on the swing as you count to ten. Jump over a set of sticks or branches. Use a cooking spoon to transfer rocks to a bucket. Jump up and down five times. Toss balls into a container. Use a sponge to transfer water from one bucket to another. Run back to the starting line. Ride a bicycle from point A to point B.